A deteriorating evening after a hot, fine and sunny day, with increasing wind and total cloud cover advanced from south-east. Wind: NW F4. Temp: 18 falling 16, humidity rising. Visibility: Bowland Fells / Emley Moor. Cloud: stratus 8ok, visibly advancing in opposite direction to wind (advanced from SE since tea time!!). Some open sky overhead after sunset. Pressure: steady for last 18hr, c1014 / 1015. No Canada Geese tonight and only few Mallard. In exchange a very wary Garganey present, throughout. No hirundines moving or Swifts, but significant numbers of Meadow Pipits overflying west, quite audiable and at height just about at the limit of unaided vision. The first noted were at 1945hr and they were still going over in twos and threes as the sun went down. The largest group, was the first, eleven birds. 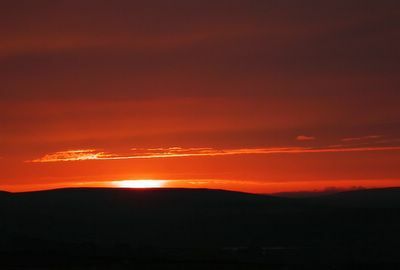 The sunset was tonight, to a lover of the skies, a wonderful affair, with stratus at cloudbase level of c4000ft extending way out over Lancashire, with only the thinnest line of open sky visible in the very far west. Just as the sun disappeared below the horizon, it dramatically illuminated the stratus ceiling, and with the pipits going over as well!! – sorry for another sunset, but its all there was to take tonight.